The Ashram is distinguished by its tranquil setting nestled within the depths and silence of the Wombat State Forest near Daylesford. Enjoy the numerous walking and bike riding tracks at the very edge of the forest. Relax, recharge and unwind with this day of yoga & kirtan. There are many paths and practices of yoga. Experience some of these different branches of yoga during this day of yoga. The day includes a vegetarian lunch & dinner and morning & afternoon tea. The reception and book shop are open after lunch for you to browse through the yoga books and products and chat about what is on offer at the centre. 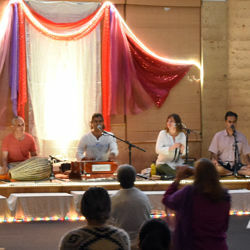 After sharing with others a tasty vegetarian dinner, the practice of mantra chanting, Kirtan, becomes a vessel of healing energy that we can direct within to achieve the quiet mind, inner harmony, balance and a refined state of consciousness.